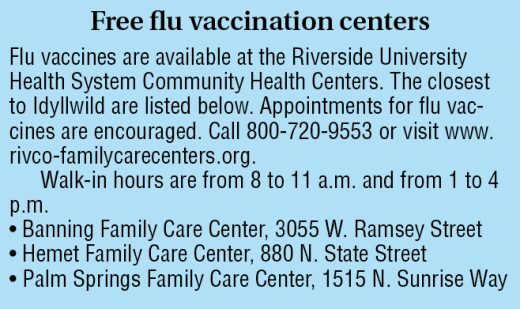 Influenza season began and is active in Riverside County. Last week, county officials announced that a 4-year-old girl died and had tested positive for influenza. This is the second pediatric flu-associated death in California this flu season. This is the third flu-related death in Riverside County since the 2018-19 flu season began. According to Jose Arballo Jr., senior public information specialist for the county Public Health Agency, two adults and the child have died from the flu. As of Jan. 12, visits to physicians for influenza-like symptoms were above normal ranges in Riverside County. Flu is statewide and at elevated levels, according to the state Department of Public Health. As of Jan. 5, both outpatient likely influenza indications and hospital admissions were above expected levels for this point in the flu season. Hospitalizations increased last week. According to the county’s press release, the child’s death occurred outside the county. It was reported to Riverside County health officials late last week. “The child had not received a flu shot and had no underlying health issues,” said Dr. Cameron Kaiser, Riverside County public health officer. Last week, 10 influenza-related deaths were reported in California, bringing the flu season total to 52 since September. About half the deaths were individuals older than 65 years. There is still time to get the flu shot, Kaiser said, adding that the Centers for Disease Control and Prevention recommends that all persons 6 months of age and older receive a flu vaccination each year. Kaiser also recommends frequent hand washing and avoiding getting close to people who are sick as ways to avoid the flu. If you or your child are sick, stay home from work and school. Last year (2017-18), there were 23 flu-associated deaths in Riverside County of individuals 64 or younger.